All of us must have used the tiny fun faces while messaging on the phone. We use them all the time. They are known as emojis. If you too are a fan of these emojis, emoji pillows are the perfect favorites for you! A large number of distinct emojis exist and it is great to be able to make your own comfortable and cute emoji pillows with these emojis patterns apart from using them in messaging. With these emojis pillows, you can get comfort, decoration or play. Follow these step-by-step instructions to make an adorable stitched emoji pillow! This article is about learning how to make emoji face with heart eyes. Place two pieces of yellow felt on one another. Get a circular plate or something circular in shape and place it on the felt. Trace around the plate or the circular object using a pencil to make a shape on the top felt piece. To make the pencil markings visible, push hard using the pencil. Take care that you make no mistakes. Cut the shapes out taking care that you cut exactly the same circles as you traced. This would make the pillow better. Use hot glue gun or sew the circles together leaving a tiny gap. This gap should be sufficient to fit the hand inside. Insert the hand through the small gap to turn it inside out. Stuff the pillow with the use of toy stuffing or polyester. Sew the tiny space or use hot glue gun after stuffing the pillow. Use white card or index cards to draw stencils. Here, we make a heart eye emoji by drawing a heart and cutting it out. You can also draw the mouth and cut it out. Using a pencil, trace the stencils onto the pillow. Once again, don’t forget to push hard without making any mistakes. Use a fabric paint or puffy paint to trace the outline did using pencil. Color the shapes and blend the paint using a paintbrush. Dry the pillow overnight. The process is finished and you have your personalized emoji pillow. 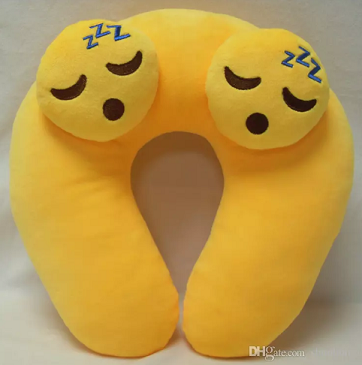 If you do not want to make an emoji pillow using these materials, check out the wide variety of emoji pillows at DHgate where you find affordable pillows. When your pillows making jobs are done, you should consider washing the emoji pillows when they get old or dirty. Here are useful instructions on washing the emoji pillows. While some pillows can be readily washed with water, others require special care, especially if they are made from wool, suede or leather. Some pillows need to be cleaned by professional dry cleaners. In case, you find no tags, you should do a spot test. Blot a little cleaning solution on a small part of the pillow using a cotton ball and let the spot dry. If you find color fading or bleeding or water rings, it means you should not use water cleaner. In order to clean the emoji pillow with wet cleaner, you can consider mixing detergent, shampoo, water and mild soap. This solution can be applied in circular motion using a damp sponge. See that you reach the crevices and piping of the pillow. Remove the excess moisture using a clean cloth and let the pillow dry. A vacuum cleaner can be used to clean the emoji pillows that can’t be wet cleaned. Crevice attachments and upholstery brush clean the pillow well. It is also possible to spot clean stains present on the emoji pillow. You can combine detergent with warm water or use little white vinegar to make a cleaner solution. Apply the cleaner on the stain and let it dry. In case the stain contains oil, you can apply cornstarch on it and let it dry overnight before vacuuming it in the morning. Emoji pillows are exciting but they are done and should be cleaned. These tips are great for any emoji pillow lover. If you have some other methods which work for these pillows, we would love to hear from you.